← Christmas catalogue has arrived! Hello and welcome to the ESAD Holidays Catalogue blog hop! Whether you’re starting at our blog, our partway through your tour, we hope you’ll enjoy all the lovely holiday creations with items from the brand new catalogue! 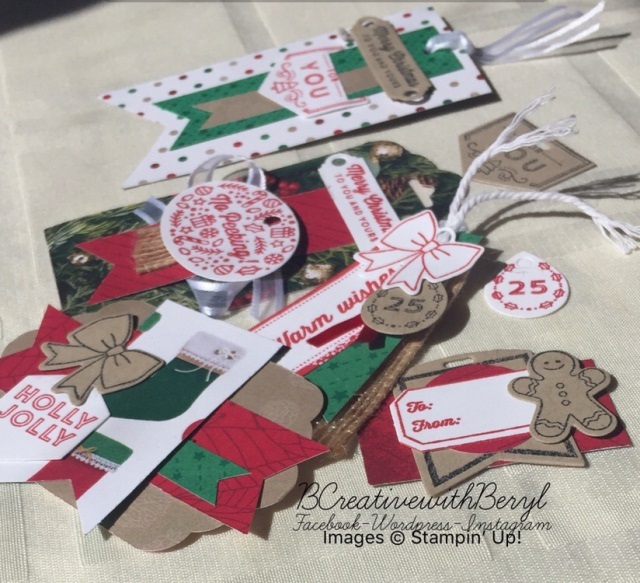 For this hop, I couldn’t resist playing with the Tags and Tidings bundle! This clever pair of products means you can stamp and cut a whole posse of cute tiny tags in just two steps! I love your tags, they look so festive and fun and I’m sure they will put a smile on everyone’s face! I was so glad to see someone else use this set for the hop! I have some images stamped and cut in a range of colours, now I just need to assemble – your tags have given me some added inspiration. Such gorgeous tags for Christmas. I’d love to use this set as embellishments on a scrapbooking layout and your clusters are the perfect example of how I should use them. Lovely work. Great tags using this bundle. Thanks so much for the inspiration. Beryl, your tags look super cute, I love them all. These are lovely Beryl! I think Im going to have to get this bundle! What a great set of tags! Thanks for showcasing this die set and showing all the tags you can get from it! Wow! What a great way to use that bundle. So many glorious tags!